Researchers at Leiden University in the Netherlands have managed to bring two graphene layers so close together that an electric current spontaneously jumps across. This could enable scientists to study the edges of graphene and use them for sequencing DNA with a precision beyond existing technologies. The team tilted two one-atom-thick sheets of graphene so that they only meet in one point, where electrons jump across from one layer to the other. Previous attempts with graphene electrodes failed because the layers are 'floppy' by nature. 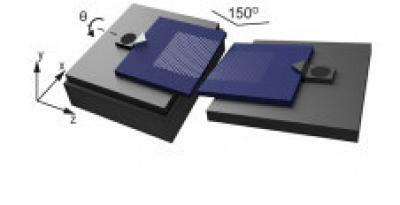 The Leiden scientists deposited them on a silicon substrate, making them rigid all the way to the edge. They brought both layers close enough together so that tunneling occurs—a quantum mechanical phenomenon where electrons spontaneously jump to a neighboring material, even though there is no direct contact. Any small object in between will enhance the tunneling. The number of electrons tunneling through will tell researchers about some of its properties. One promising future application could be DNA sequencing. As a single DNA strand passes through the tight gap between the graphene layers, its nucleotide letters A, C, G and T will alternately allow a different number of electrons to tunnel through. From this, scientists might be able to read out a DNA strand relatively quickly. The team explained: "Companies are now developing another method where they run a DNA strand through a hole which also has water flowing through with electrically charged particles. From the strength of the current they know which base letter is partly blocking the hole. Our method is potentially much more accurate. Or better yet: we could combine both methods in the future". The scientists also stated: "Another important next step is to scan the edges of graphene, which is as attractive as DNA sequencing. The chemistry at the edge of graphene is extremely difficult to probe, and now we have a very precise devise to do so".